Sami serves as Cephalonia's main port and provides a convenient gateway to the other Ionian Islands. You'll find plenty of places to visit near Sami: Petani Beach (in Lixouri), Fiscardo (Scuba & Snorkeling & Emblisi Beach), Assos (in Assos), Ammes Beach (in Svoronata) and Katelios beach (in Katelios). 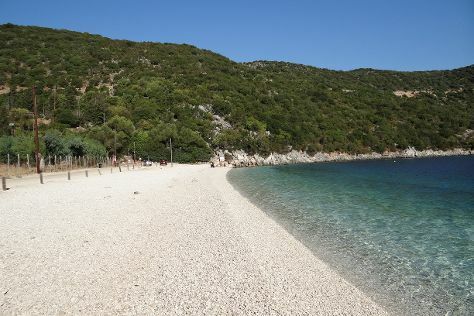 And it doesn't end there: kick back and relax at Antisamos Beach, tour the pleasant surroundings at Myrtos Beach, make a trip to Monastery of Agios Gerasimos, and explore the fascinating underground world of Drogarati Caves. To see other places to visit, photos, and more tourist information, go to the Sami trip itinerary builder. In July, plan for daily highs up to 35°C, and evening lows to 25°C.